Well, in preparing for my professional development course for my district, I surfed across this FABULOUS chart. I can’t take credit, but that is way okay with me. 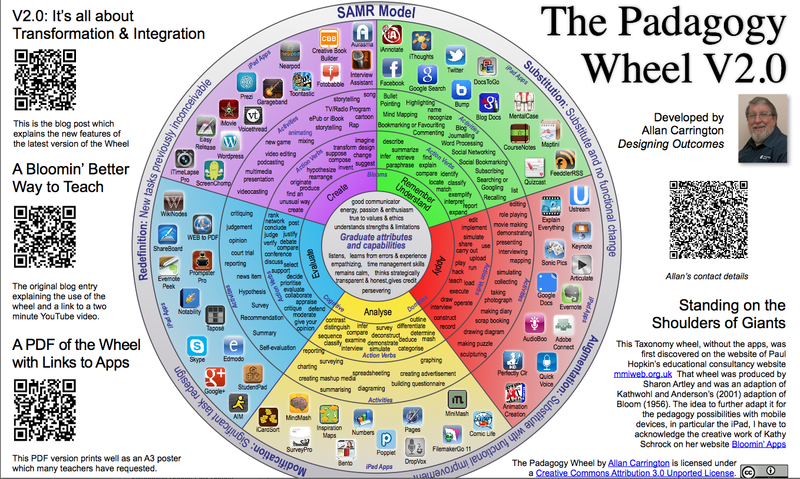 After all, this chart is a teachers’ guide to infusing technology and media into their lesson plans. And… the chart tells which app fits into which part of your unit. How cool is that? As an In Class Resource teacher, I’ve worked in lots classes with lots of teachers who (I think) really want to get the technology piece into their instruction. But, let’s face it, the number of apps is overwhelming (and growing by the minute). What’s a edutech minded teacher (regardless of their years of teaching) to do? Well, in my mind, this does it all; this chart takes the decision factor out of the equation and frees the teacher up to do what he or she loves to do: teach! Here’s a screen shot. Pretty hard to read, but I fell head over heels when I saw it. I hope you say, “How cool is that?” too! P.S. This screen shot is interactive; find your domain, identify an app, click, download and go!